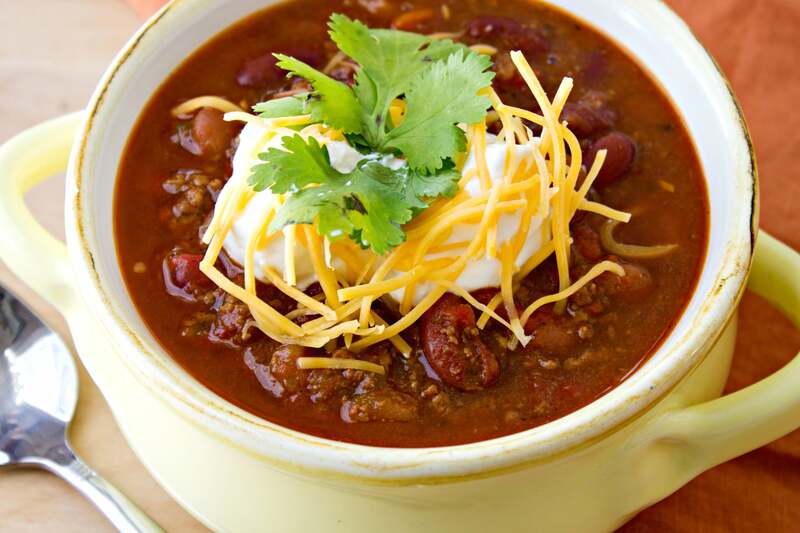 Simple Classic Chili – A no-frills recipes for a simple classic chili. Made with lean beef, two different kinds of beans, and a whole lot of heartiness, this classic chili is perfect on its own or mixed into cheese for a yummy queso dip. Another fall week, another record high temp here in Atlanta. 87 degrees to be precise. It was the hottest Halloween on record. I am about fed up with this heat! I need it to be cold enough so I gotta wear socks on my feet around the house and sweats when I go to sleep (that’s how I measure temperature). Is that too much to ask for?! I realize that I may sound ridiculous to you Northerners who are reading this, since you’ve probably had cold weather since September and probably hate it already. But just let me have my moment. Today’s recipe is a desperate attempt to convince myself that fall is here, even if the weather won’t cooperate. I always get a craving for chili around this time of year. It’s a comforting, easy meal that I can add to anything: baked potato, nachos, and even spaghetti (don’t knock it ’till you try it!!!). So when that craving kicked in last week, I just had to make it. Cold weather or not. Every time I make chili, I make it slightly different than the last. So I wanted to use this opportunity to finally settle on a simple, classic recipe that I loved. But also a recipe that I could easily add things (veggies, spices) without having to adjust the other ingredients. And that’s the recipe we have here, folks! A simple, bare-bones chili that satisfies the classic craving but that you can also make your own. Want to add zucchini and squash for more veggies? Do it! Want more spice? Add a jalapeno! Don’t like beans? Wait – you don’t like beans?! Fine. Then keep them out! But I’m still judging you for not liking them. I could LIVE off beans and rice. Decide what kind of chili you want before you get started. Are you going to use beef or turkey? Kidney beans, black beans, or pinto beans? Do you want extra heat? Extra veggies? You want to plan these things out so you make sure to get any additional ingredients that you need. If you want to add more vegetables, only add 1-2 cups max. You don’t want the chili to get overwhelmed. Corn, zucchini, and squash are all great options. If you want to add spice, but are nervous about making it too spicy, use dry spices. That way, you can add a little at the end, taste, and then add more, if needed. Fresh jalepeno is tricky because you have to cook it with the other veggies so that it softens up. You won’t be able to taste the complete chili before adding in more. You can use any ground beef or turkey for this recipe. They are interchangeable. Same goes for the beans. But I would stick to black beans, pinto beans, or kidney beans since they hold up better. Use a big pot or dutch oven for the chili. You’re going to be making tons of chili so you need to have a large vessel to handle the job. Added on 11/29/2016: As you can see in the photos, I cooked this chili in a cast iron dutch oven. This is a major no no that I was not aware of. Cooking acidic foods in the cast iron will eat away at the coating, something I learned first-hand. My cast iron started peeling a few weeks after making this chili. It was not pretty! So make sure you use a stainless steel pot or enameled dutch oven. Or anything else besides cast iron. If you want a chunkier chili, buy whole tomatoes and rough-chop them yourself. I wanted the tomatoes to break down into the chili so I didn’t want the chunks. That’s why the recipe says petite diced tomatoes. Make sure to purchase your ingredients for serving (shredded cheese, sour cream, onions, diced avocado, cornbread). I cannot tell you home many times I’ve done this! I usually just focus on the recipe and forget all about how I plan on eating it. The cook time of the chili all depends on how soupy you want it. Watch the chili and when it gets to the desired consistency, remove it from the heat. I like mine thick, so I let it cook for the full 60 minutes. But if you like it runnier, it should be done by 45 minutes. And there you have it! A simple, classic chili. How do you plan on making yours? Let me know if the comments below! A no-frills recipes for your good ole fashioned chili. Made with lean beef, two different kinds of beans, and a whole lot of heartiness, this classic chili is perfect on it's own or mixed into cheese for a yummy queso dip. Grab a large pot or dutch oven and place on burner. Set heat to medium and add oil to pot. Once pot is hot, add ground beef (or turkey) and begin to brown it. Once it's completely cooked, scoop out of from pot and into a small bowl and set aside. In the same pot used to cook the meat, add diced onions. Raise heat a little so it's between medium and medium-high. Cook until onions start to become translucent, about 5 minutes. Add in peppers and cook until those start to soften, about 5-8 minutes. Make a well in the center of the onions and peppers. Add garlic so that it receives direct heat and starts to brown. Do not let garlic burn! It should only take 30 seconds for it to brown and release its fragrance. At that point, stir into the onions and peppers. Add the salt, cumin, chili pepper and cayenne to the vegetables. If you don't like spice, only add 1/4 teaspoon. You can taste the chili at the end of the recipe and add more if you need extra kick. Stir spices into vegetables until evenly dispersed and let them cook for 30 more seconds. Reduce heat to medium. Add back meat and stir in chicken broth. The addition of the broth will break up the browned bits on the bottom of the pot. Use your wooden spoon to help those bits break off and mix into the broth. This is pure flavor, people! Cover and bring mixture to a boil. Once boiling, remove lid and reduce temperature to medium-low so it's now simmering. Let simmer (uncovered) for 45-60 minutes until chili is the desired consistency. I like mine thick so I used those full 60 minutes. Add tomatoes and beans to mixture. Simmer for another 10 minutes to bring chili back to temperature. Once it's done, give the chili a taste to see if you need more salt or cayenne. Give it one last stir. Serve with your favorite toppings. I like mine with sour cream, cheese, and a sprinkle of cilantro. Yummm! The flavor of the chili will be even better the next day. Chili will keep fresh for about a week and frozen for up to three months. Do you leave the garlic cloves whole or do you chop/mince them? Good question! Mince the garlic before adding. I will adjust the recipe to make that clear. I hope you enjoy it! Turned out great, super delicious, hubby is on his second bowl full.. 🙂 thank you! Yay! I am so happy you both like it! Hey Sharon I’m cooking this now! Do you also drain the tomatoes? Hi Elizabeth!! Nope, don’t drain the tomatoes. You need that liquid to keep your chili from being too thick. Thanks for your question and I hope you enjoy!!! Delish! Had to improvise a bit, but I will definitely make again. Yay!! So glad you liked it. If you have an tips for how you improvised, feel free to share! Love all the veggies, you put in yours, it really does look amazing! I’m hoping you get some Fall weather soon, 80 in November really is too warm. How hot does it come out with your spices? I need to prepare it for someone that likes it hot. It’s super mild. So add a jalepeno with your other peppers to give it more spice. When the chili is done, give it a taste. If it needs more spice. Add a little more cayenne hot sauce and stir. Hope that helps! thank you, also, do you drained rinse the beans? I didn’t rinse them but I definitely drained them. Thanks for the question! This chili was delicious! Saving this recipe. Thank you! Mmmmm chili. The ultimate comfort food. This looks soooo delicious! Your photos are beautiful! I am the same way… once the temps drop, I want warm, fuzzy socks and blankies and books and warm coffee. And also the comforts of a good, hearty delicious chili. Thanks for sharing this recipe! Would love to make it vegetarian and actually have some veggie crumbles in the freezer–they’d be perfect! Thank you so much! Thankfully it finally got cold this weekend! Fuzzy socks here I come! So glad you can make this version vegetarian! Just use a veggie broth instead, along with your veggie crumbles. Just made a batch of chili but I used chick peas instead of kidney beans. I agree with you that chili gets better by the day. Thanks for you Rx. The weather in Shanghai is perfect for chili! Love all the tips and your photos are fantastic! Thanks so much! Glad you can enjoy this chili in Shanghai too! I live in Florida and like Atlanta, it’s been warm here! Warm weather won’t stop me from enjoying a great bowl of chili. Great recipe, Sharon! Oh man! It’s even hotter where you are! Hope you like the chili! I love your list of ways to make the chili more unique to your tastes. Especially #7 – I love guacamole on chili, but never remember to buy the avocados. I rarely save recipes because I never have any time (patience, really) but I am totally going to make this! Oh this looks so yummy! I am pinning it for later =) Can you freeze this? Are you kidding me!_ This is so mouthwatering I literally want it now! I’ve never added sour cream to my chili, I will definitely have to try! I need to add this to my dinner lineup next week. Thank you so much for sharing. Can’t wait to check out more of your recipes. Really?! You’ve never had sour cream in your chili?? It’s so great! I am a whimp when it come to spicy food so that’s why I started adding it. It makes the spice a little more mild. Can’t go wrong with a big pot of classic chili. Deer season will be here in two weeks and this is a tradition around our house. Nope you sure can’t! I haven’t made it with venison before but I bet it’s delicious! I looove chili and I make it all the time. And I’m a lot like you, I make it a little different every time! But I’ve never used chicken broth so I’m definitely going to try that next time! We love Chili – so I am absolutely pinning this to come back to! This was so delicious I followed exactly from your instructions! So perfect for Fall! Aw so glad to hear it! Thanks for the feedback!